Myth…Inflammation of muscles and joints can be healed completely with anti-inflammatory medications and bracing, right? WRONG!! Stretching SAUncategorizedMyth…Inflammation of muscles and joints can be healed completely with anti-inflammatory medications and bracing, right? WRONG!! Aspirin and nonsteroidal ant-inflammatory drugs (NSAIDs) such as ibuprofen do serve a couple of purposes. Taken properly, they can reduce pain and inflammation in joints and soft tissues, such as muscle and ligaments by blocking the production of prostaglandins (Chemicals that cause inflammation and trigger transmission of the pain signal to the brain). But, in order to start the healing process, it’s up to you to take advantage of the comfort levels afforded to you by painkilling. When you are in pain, you tense up to protect the injury from further harm; your whole body forms a “splint” of sorts. Protection takes enormous energy and causes imbalances and tension everywhere. Additionally you don’t sleep well when you are hurting. And, as your rest is disturbed, your ability to cope with the injury and make good decisions is diminished. Feeling better may allow you to move the injured joint or flex that injured muscle just a little, so that you have less need to protect yourself. You’ll be more relaxed; you’ll sleep better, allowing your body to rejuvenate more quickly. And most important, when you feel comfortable, you will be able to move, increase the range of motion and pump blood to the injury to promote healing. It is not advisable to use NSAIDS without doing anything else about your injury. As mentioned earlier, the medication will only mask your pain and it will not necessarily remove the cause and nature of the injury. Get regular treatment with Active Isolated Stretching and Active isolated strengthening at Stretch therapy SA in conjunction with NSAIDS. A few words of caution: Pain is your body’s way of communicating clear messages to you about the status of an injury. Don’t use painkillers to mask pain that you need to be evaluating and using for information. There where an incidence and surely not the only incidence were an athlete used ibuprofen to mask the pain of a stress fracture in her shin, and continued to run – with disastrous and long-term consequences. Also, please keep in mind that even medication brought over the counter is still medication. 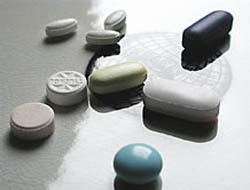 NSAIDs have possible side effects of which you need to be aware: nausea, indigestion, diarrhea and peptic ulcers. Aspirin could cause clotting disorders, prolonged bleeding, colitis, gastrointestinal disorders, ringing in the ears, and aggravation of asthma, hives and goat. BE CAREFUL, please consult a physician prior to using any medication.